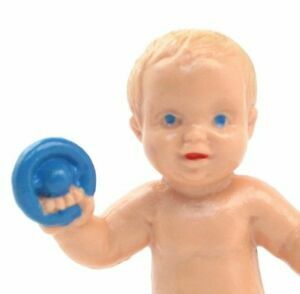 Baby standing with a Blue Rattle - Bully Babies - 4 piece set - Made by Bully in Germany. Four babies posed as shown Back in the 1980's and 1990's we imported a number of Bully figures from Germany. Back then, they produced a range of 2" to 4" hand painted, plastic molded animals sold under the Bullyland Brand. We have boxed up the remaining figures we have into sets. These are all new, never sold, but most items are not in their original packaging and have some shelf wear, might have some missing paint in areas. These figures come as a set and will be the same as the figures in the photos. Much of our old stock is very limited and subject to quantity on hand.